I am bad with directions. In fact, I am comically bad with directions. 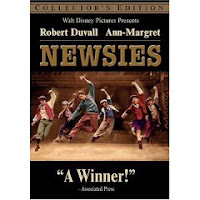 It was hard enough in New York, where the streets are numbered and Subway signs tell you you're about to exit onto the Northeast corner of 78th St and Broadway. Now I'm in San Francisco, where streets and alleys are sometimes indistinguishable and most people drive to the grocery store. Not getting lost on my way to the freeway is a constant challenge for me. You should see me on roadtrips. My husband, who we'll call the Trini, likes to drive, which means he has to navigate at the same time. I'll hold the map, sure, but relying on me for directions is like relying on Gwyneth Paltrow to name your kids. So how have I survived? How am I back at home right now given that I have, in fact, left my house in the past week? 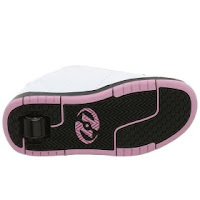 The answer to these and so many other questions is TomTom. What is the GPS device on my dashboard that tells me exactly how to get places in a soothing British voice? 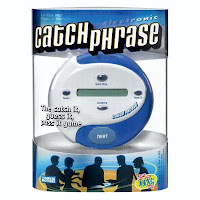 Which GPS device plays nicely with Google Maps and lets you download extra voices (celebrity voices, no less)? What did I buy, on sale, before I even owned a car? What did the Trini get for Christmas last year? What did he recently try to take away from me in order to make me learn my way around my own city? What did I have to steal from the Trini's dresser when he was asleep and hide in the Trivial Pursuit box in order to avoid learning my away around? I love my husband, but I think I might love my TomTom more. 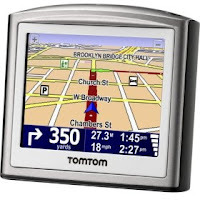 Seriously, though, I did the research, and the TomTom One 3rd Edition is the best entry-level GPS device out there. You don't need text-to-speech unless you're vision impaired. Also, if you're vision impaired, you probably shouldn't be driving. I love Mighty Magnets. I know what you're thinking: "$9 for magnets? Really?" But seriously. These are the only magnets you will ever need. They are super strong. 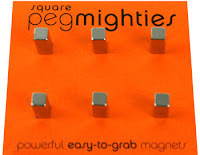 Below I've listed some of the ways Mighty Magnets get used in my house, as well as some other possible scenarios in which they might be useful. Bonus points because these things could literally save your life. I am both messy and an impulsive shopper. This was a lethal combination when worked at The Container Store, where I could get 40% off of all the storage and organization products I thought I needed. I used to spend entire paychecks on devices to help me fold my clothes and organize the lids to my pots and pans. Don't get me wrong, I love most of the products I bought there. It was just a very expensive place for me to work. 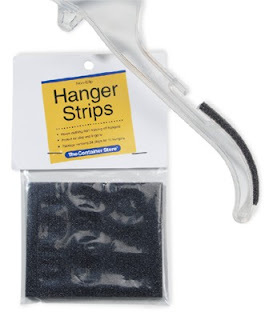 Still, my favorite thing in the entire store cost $1.99: Hanger Strips. I never understood why hangers cost so much money. Seriously, how many people actually spend $6.99 on a plastic hanger? (Answer: you'd be surprised.) To me, a hanger is a hanger. I buy white plastic ones by the box and replace them when they get lost or stepped on. The problem is that women's clothing is complicated. There are all sorts of tank tops with little straps and slippery things with wide necklines and strapless garments that you're supposed to hang by little loops sewn into the lining. They require expensive hangers. A classic example of the man keeping me down. Then I discovered these little foam strips that adhere to my white plastic hangers and keep my fancy lady clothes from slipping into a pile on my closet floor. Brilliant. I steered countless other women toward this solution (that's what we called products at The Container Store) instead of letting them buy expensive grippy hangers with clips and hooks. Maybe later I'll write about the awesome device I bought to help me fold my clothes. I don't brush my hair. Maybe I shouldn't admit this on the internet, but I have very curly hair and brushing it leaves it frizzy. It reminds me of when I was 8 and my mom used to brush all the curls out of my triangular puff of hair (I was thinking of posting a picture, but I've shown this blog to all of my coworkers and I'm not ready for my boss to see photos of me in a tap-dancing costume). 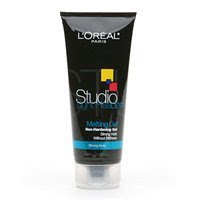 how to deal with my curly hair when I was 8, maybe I would have gotten to french kiss a boy in middle school like all my friends. Anyway, now I'm married and have great hair. Shiny, bouncy curly hair. The kind of hair that makes old ladies stop me in the grocery store to ask me if this is really my natural hair. And I use dandruff shampoo. 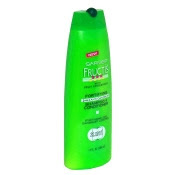 Specifically, Garnier Fructis Anti-Dandruff shampoo+conditioner in one. 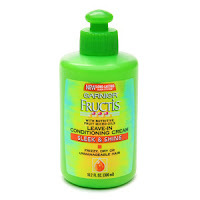 Then I follow it up with Garnier Fructis Leave-In Conditioner and L'Oreal Melting Gel. I never brush it, and I try not to run my fingers through it as I apply the products. Please feel free to discuss how great my hair is in the comments section. 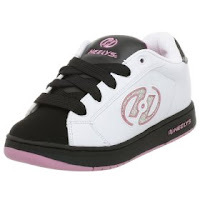 And if there are any awkwardly tall 12-year-old girls with frizzy hair reading this, it gets better. I promise.